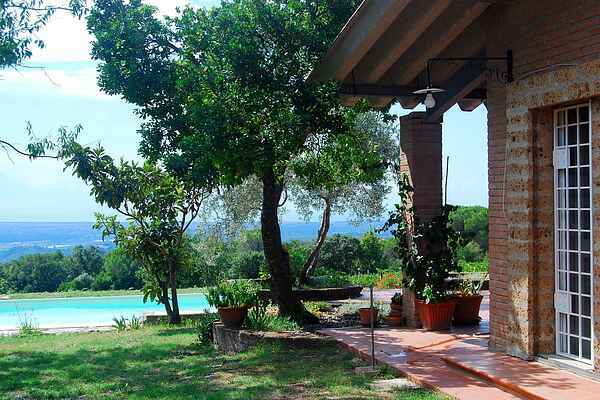 A holiday A Casa offers absolute rest and relaxation in a natural, unspoilt setting, overlooking the sea. The perfect choice for nature fans, for artists looking for inspiration or anyone wishing to combine peace and tranquillity with the liveliness of the coast, which offers a wealth of opportunities to young and old alike. The property is set across 25 hectares of which 5 are made up of vines, olive groves and walled houses. A wood surrounds the property and the closest neighbour is 1km away. The nearest town is Cecina followed by Rosignano, which offers a good range of shops, a great bakery and a pharmacy. Cecina has an excellent hospital which can be reached in around 20 minutes and is approximately 12-15 km from the property. There is a good selection of supermarkets and on Tuesday there is a street market selling everything you may require. The nearest beaches are in Cecina Marina (sand and fine stones), Vada (sand), Rosignano (famous white sand), Castiglioncello (stones) and all can be reached within 30 minutes. Wifi is free with a limit of 10GB per week. The house owner can provide an increase of this limit against payment. Riparbella has a fabulous selection of restaurants, but just 1.5 km from the property you will find a good eatery with reasonable prices. Pisa, Florence, Lucca, Volterra, San Gimignano and Siena can all be reached with ease. A convenient way to visit Florence is by train. Why not visit the nearby age-old villages of Castagneto Carducci and Bolgheri.